More Than Ready colt Sonic Boom will step into Group 1 company following his second stakes score in the American Derby-Gr.3 (1800m) at Arlington Park on Saturday. Sonic Boom went straight to the front and was never seriously challenged as an odds-on favourite in Chicago. He has now won 4 times, all on turf, from 9 starts for owner Robert Lothenbach and trainer Ian Wilkes. Sonic Boom (3c More Than Ready – Silent Circle by Indian Charlie) won a Kentucky Downs maiden last September and was sent to California to qualify for the Breeders’ Cup Juvenile Turf. He came up just short in the Zuma Beach Stakes-LR at Santa Anita and was put away for the remainder of 2016. Wilkes had him primed to win the Columbia Stakes-LR first-up at Tampa Bay Downs in March and he went into the American Derby on the back of an allowance victory at Churchill Downs. Bred in Kentucky, Sonic Boom is a younger brother to More Than Ready stakes performer Galientos and was knocked down for $135,000 at the Keeneland September Sale. 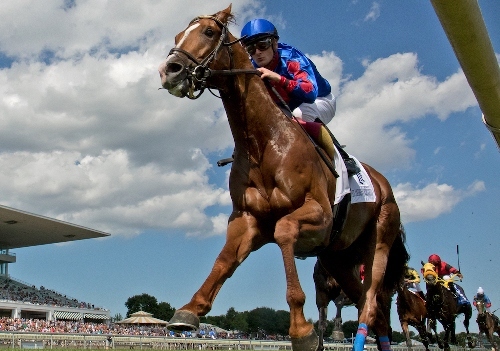 He has banked $245,800 with the $400,000 purse a tempting target in the Secretariat Stakes. Former French filly Uni is another More Than Ready 3yo with Group 1 aspirations in North America. Uni won the Prix Matchem-LR (1800m) at Maisons-Laffitte in May and created quite an impression first-up in the Belmont Oaks Invitational-Gr.1 (2000m) on Saturday. She blew the start and powered home for third to fill out a trifecta for trainer Chad Brown. More Than Ready sired a promising maiden winner earlier on Saturday at Arlington when She’sadowntowngirl swamped her rivals over 1700m. A 3yo homebred for Richard & Connie Snyder, she was content to trail the field until angling into the clear and closing with a rush to score by two lengths. She’sadowntowngirl’s dam My Other Girl (Bernardini) is a half-sister to More Than Ready’s Fantasy Stakes-Gr.2 winner Ready To Please. More Than Ready (USA) returns to Vinery Stud next month for his 17th southern book at a $66,000 (inc. GST) service fee.